In this workshop, you begin with a fussy-cut panel around which you build frame after frame creating a pleasing setting for the central panel. 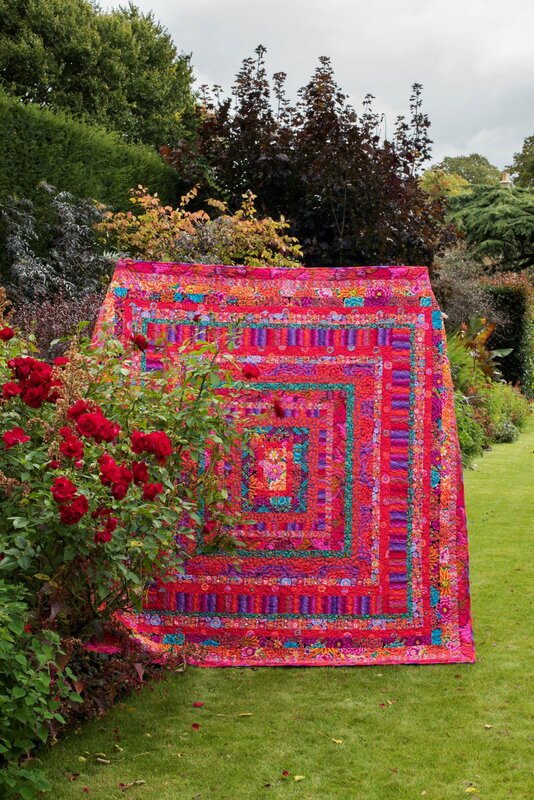 Lunch, required design wall fabric, and a 25% coupon off the price of one Kaffe Fassett book are included in your fee. Note that they have an awesome new book "Quilts in Cotswolds" coming out soon! The Ice cream quilt is out of this book. Ice Cream Quilt from Quilts in the Cotswolds, Kaffe’s NEW 2019 release. In this workshop, you begin with a fussy-cut central panel around which you build frame after frame creating a pleasing setting for the central panel. Kaffe’s Ice Cream quilts are colour bias. For the central panel, choose a favorite large-scale design. Then bring 12-18 prints in tonally similar colours but varying in scale and design to audition for the logs/frames. For the logs, you need as little as 1/8 yd to as much as 1 yd for each. The logs are varying widths and can accommodate varying scales and designs. If you are not sure how you are going to proceed, that’s okay. You can bring your stash favorites and be prepared to shop with Kaffe and Brandon at the workshop. Please feel free to bring any fabrics you would like to use to the workshop-these do not have to be Kaffe Fassett Collective fabrics. Please do NOT precut fabrics before class. You will not be sewing in this class, we will be focused on color and design. Rotary cutter, rotary ruler (6” x 12”) or similar. Book - Will be available at Lyons Quilting once it is released! Please do not bring cutting mats, irons, lunch (unless you have a specific diet) or the design wall flannel - these are all provided by Lyons Quilting!